This book helps the vocalists, instrumentalists and dancers to perform their art in time and rhythm. The Tabla is not a very attractive instrument when played alone but it certainly when played alone but it certainly attracts the audience on the double, triple with the Moharas Tehai, Pushkara, Rela, Laggi, Ladi, Paranas and Uthans, etc. Playing the Tabla independently is more difficult than when it is played with a group of other musicians in an orchestra. 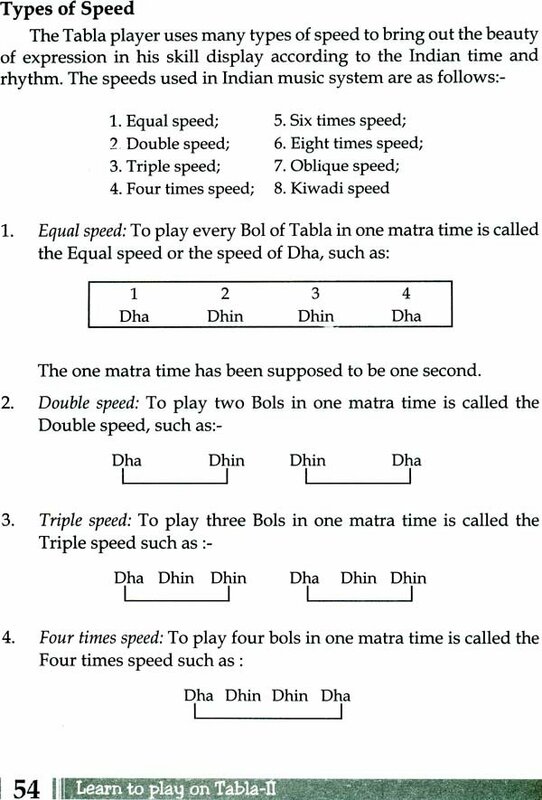 A Tablist has to practice well be a great help to those whe are eager to learn the Tabla and ultimately reach the advance course. 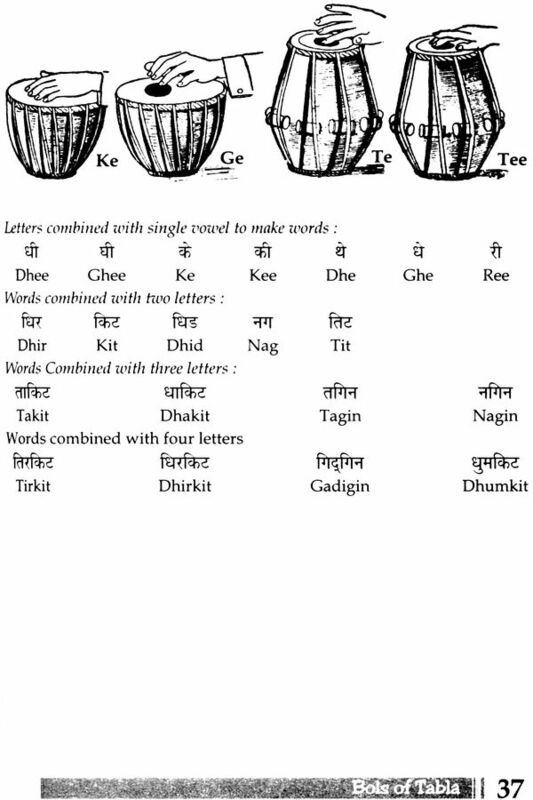 The Tabla instruments plays on essential role in display in Music and helps the vocalists, instrumentalists and the dancers to displays their arts in time and rhythm. 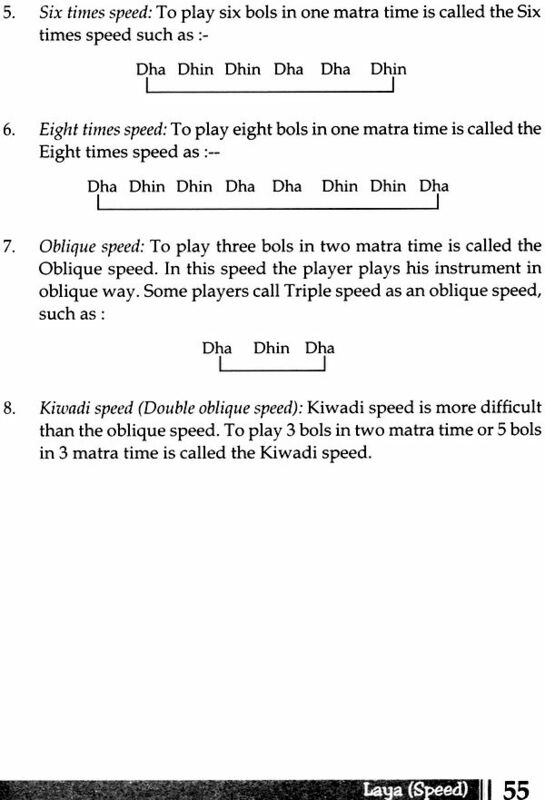 Tabla is not much attractive instrument if played independently. 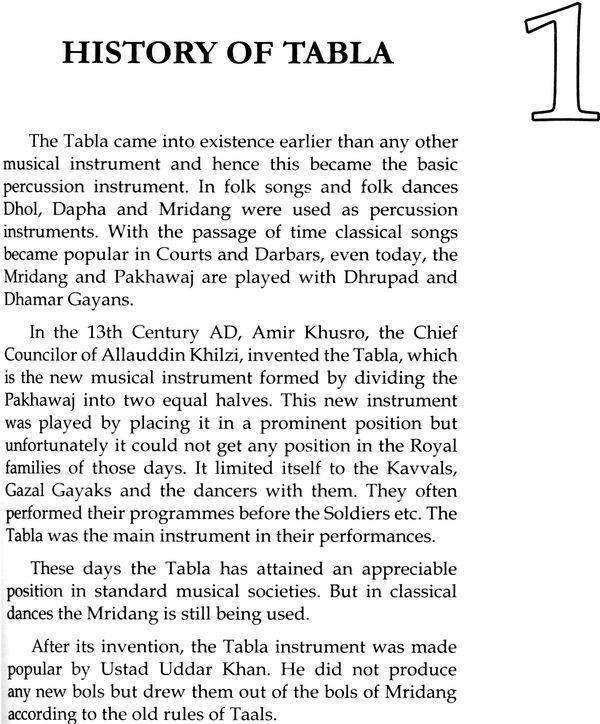 But the tabla players please the audience with double, triple and four speeds of Thekas with Moharas Thehai, Pushkara, Rela, Lagi & Ladi Parans and Uthans etc. Playing the Tabla independently is more difficult than if it is played in the group· of musicians with orchestra. The player has to make a good practive to play the instrument independently on the stage. 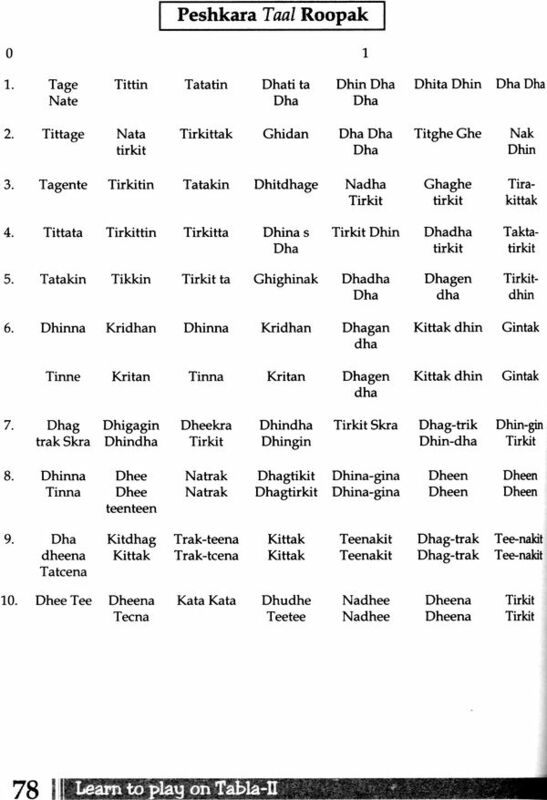 We have given Thekas of Taal in different types, doubles, triples and fourths speed of various Thekas with Peshkaras, Kayadas, Parans, Lagis, Ladis and Relas in very easy and clear way. The reader can make god practive on this instgrument. 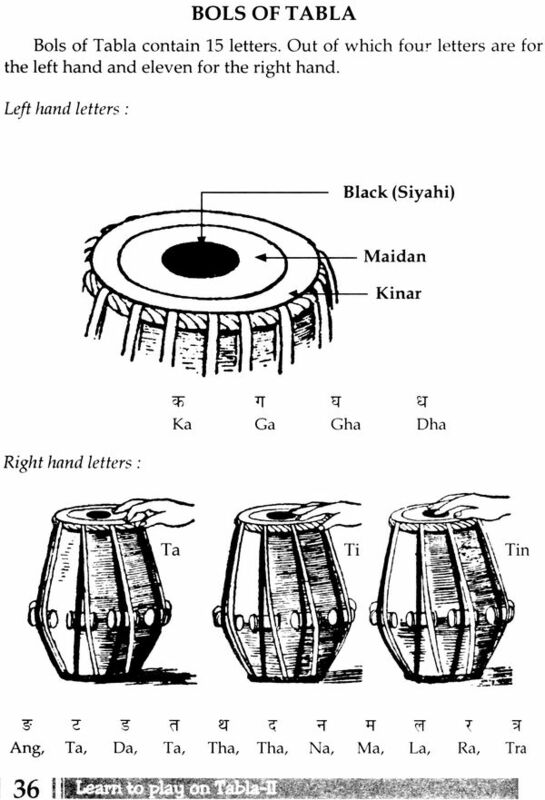 We have also given the history of Tabla with their Gharanas and their styles of playing Tabla. 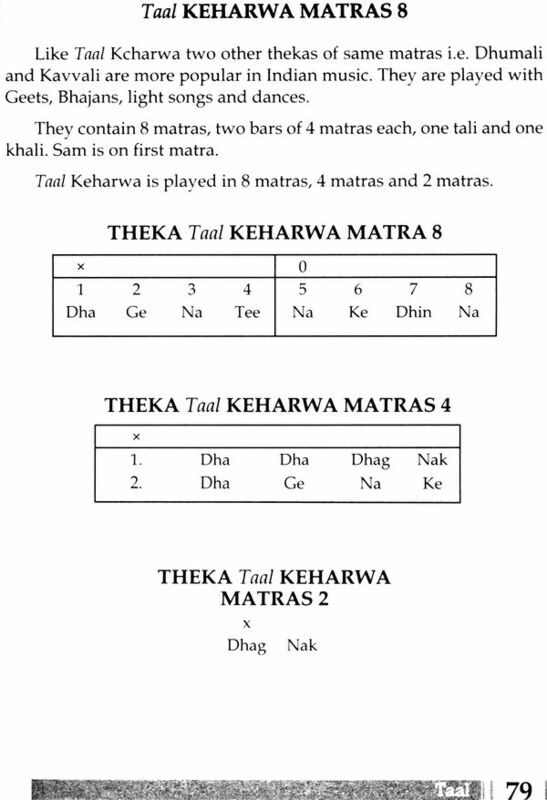 If the reader before practive according to this book tries to go through the firs ok on Tabla, the Tabla player can get sufficient knowledge of playing Bols and Thekas and tuning the instrument.